A few years ago I came across a blog by Chris Brogan and he suggested the idea of choosing 3 words as a guide for the New Year. Why 3 words? Why not just 1 word? I found it interesting to learn that by choosing 3 words, it gives you a 3 dimensional approach to your plan and goals. Human nature demands that we determine our value based on the scoreboard or scale. If those numbers are not moving in the direction of our goal, then we must be doing something wrong. My husband and I had a conversation about choosing our 3 words for the year. We also encouraged our son and exchange student to do the same. So we posted our words on our bedroom doors. Throughout the year, it was great platform for conversation. We would often talk around the dinner table about how we are doing with the words we had chosen. This year my 3 words were revealed to me on a very brisk morning walk in late December. As January was approaching, I knew it was time for reset, renewal and reflection. My life and business plan includes a goal of massively increasing the numbers of people we are serving and influencing. So, with that in mind, I asked God to reveal to me what my 3 words would be for 2018. 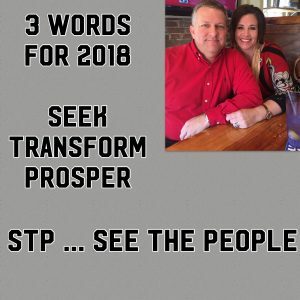 In order to fulfill the goal, I need to “see the people”… STP. This was a starting point to reveal my 3 words. As I mentioned earlier, Chris Brogan shared how to choose the words. The words need to stand alone in order to benefit from the power of the process. As I continued on my walk, I thought about how I needed to grow in order meet my goals. Seek, Transform, Prosper became my STP which ironically is a brand of fuel. The picture posted in the blog today is on my phone and taped to my bathroom mirror. Every day I ask myself how will I seek to transform the renewing of my mind to prosper in my life. It is a different twist on reviewing your goals for the day. Using the 3 word filter impacts every area of your life. As I wrap up this blog post for the week, I am reminded how I have been impacted by another blog writer. This one idea has not only influenced my family but those I mentor and coach. I wonder if Chris Brogan was struggling to write and deliver his blog the day I read it. We all have the power to influence others. Our greatest talent is consistency and loyalty to the process. I challenge you to think about your 3 words. Don’t wait until December. You have a lot of year left.